I was reading dooce one day last week and noticed a link she posted to some interesting cloud formations. As I'm a proud member of The Cloud Appreciation Society, I clicked through immediately. 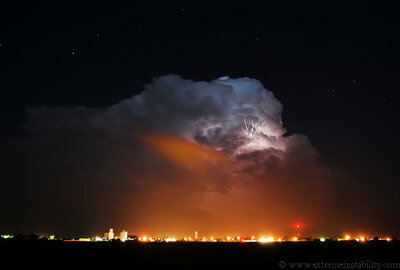 This site features some spectacular sky and nature photography. And I saw photos of lenticular clouds, which I'd never seen before. 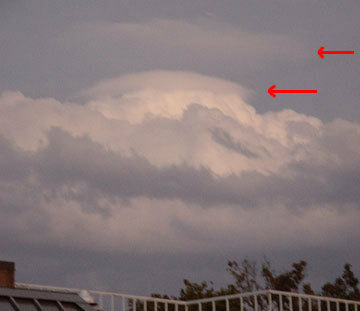 Skywatchers sometimes mistake lenticulars for UFOs because they are often perfectly round or oval. Since the clouds usually form and hover over mountain tops, groups of them look like extraterrestrial ships scouting for a large enough landing area for the entire fleet. As I viewed the images, I reflected how unlikely it would be that I'd ever see a formation like this with my own eyes. They are seen under certain conditions, but I thought the odds were against me. Question: What is one way to get a very persistent blogger to go on a "blogaway?" Answer: With Mother Nature's and Tropical Storm Ernesto's help (because sometimes only 55 MPH wind gusts can get some bloggers to stop) — blackout. We had a twelve-hour blackout on September 2nd. I missed only one day to post, but it was a good reminder of the importance of electricity to the blogosphere and beyond.